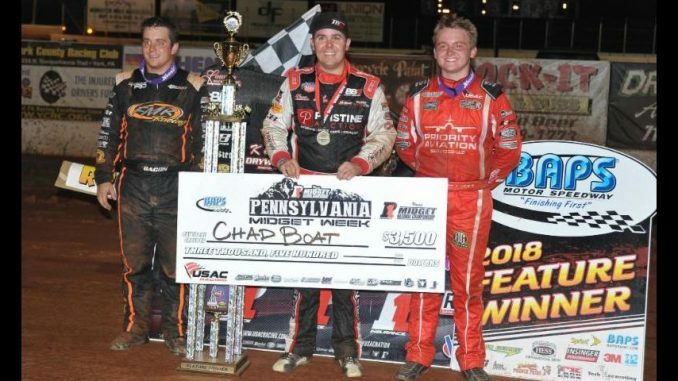 YORK HAVEN, Pa. (August 5, 2018) — Chad Boat’s switch from white to black was akin to the flick of a light switch in Sunday night’s USAC P1 Insurance National and Eastern “Pennsylvania Midget Week” finale at BAPS Motor Speedway. There was no trepidation whatsoever, however. The Phoenix, Arizona driver and his team rolled the black car out of the hauler at the 3/8-mile dirt oval with a myriad of confidence after a palate of struggles plagued them in the white ride during recent trips to Mid-America and the launch of the Pennsylvania swing. Boat led all 30 laps and was undeniably dominant from start to finish despite a lengthy open-red situation that may have seemed like a three-hour tour to him as he sat in his seat, anticipating the final six-lap stretch. However, Boat, as he had done time and time again on each restart throughout the 30-lapper, motored away from the competition to win his eighth career series feature. Boat immediately grabbed the lead on the start from his outside front row starting position, surging past point leader and pole sitter Logan Seavey on the initial lap to gain a lengthy advantage that would be the theme throughout the whole deal. The first stoppage for a calamity occurred on the eighth lap when series Rookie and fifth-running Kyle Craker flipped between turns three and four, catching up Tyler Courtney and Spencer Bayston in the carnage as well. Miraculously, all three were able to restart. Throughout the mid-portion, Boat partook in no less than eight starts and restarts following yellows and reds, but each time, it would play out in a similar manner with Boat running roughshod on the field and splitting away. The only one able to hang in Boat’s neighborhood for more than a moment was Saturday night’s Lanco winner Zeb Wise. On the lap 23 restart, he set up shop about four lengths from the tail of Boat, but Boat slammed that opening for opportunity and was gonzo once again. Two laps later, the final stoppage came in the most serious accident of the night when ninth-place Kenny Miller flipped over the turn three guardrail, coming to a rest upside down nestled between the back side of the wall and the sponsor billboards. Though Miller was awake and alert when emergency personnel arrived at the scene, he was transported via ambulance for further observation. The ensuing cleanup and the transportation of Miller led to a lengthy, 40-minute red flag period in which crews were permitted to tend to their machines to tinker and make adjustments that could alter the outcome of the race. It didn’t make a difference before or after the changes during the red, Boat was headed out of Pennsylvania with a fatter wallet and another trophy in his case as he once again throttled away from Wise on the restart, closing out a pretty flawless performance with a 1.812 second victory over Wise, Brady Bacon, Eastern point leader Alex Bright and Tanner Carrick. Contingency award winners Sunday night at BAPS Motor Speedway were Spencer Bayston (Simpson Race Products First Heat Winner), Andrew Layser (Competition Suspension, Inc. Second Heat Winner), Zeb Wise (Chalk Stix/Indy Race Parts Third Heat Winner & KSE Racing Products Hard Charger) and Kyle Craker (Wilwood Brakes 13th Place Finisher). NEW USAC P1 INSURANCE MIDGET NATIONAL CHAMPIONSHIP POINTS: 1-Seavey-820, 2-Bacon-722, 3-Bayston-718, 4-Boat-717, 5-Grant-679, 6-Courtney-669, 7-Carrick-642, 8-Thomas-624, 9-Wise-523, 10-Ryan Robinson-470. NEW USAC EASTERN MIDGET POINTS: 1-Bright-1138, 2-Layser-1093, 3-Jackson-990, 4-Miller-908, 5-Pierson-901, 6-Wilson-581, 7-Ryan Greth-578, 8-Conkling-558, 9-Rice-544, 10-John Anderika-456.